As a farewell gift, on my retirement from the directorship of NRICH, members of the team organised a day in Cambridge when colleagues and friends I have worked with over the years came together. Many of those who attended, as well as some who could not make it, sent 'retirement presents' in the form of problems to solve. The morning was devoted to working on some of those problems. We sat in groups and, as each problem was presented, enjoyed the challenge of doing mathematics together. All the problems were engaging, though there were many more than we had time for on the day. In January 2011 the NRICH team has decided to write problems for the site based on some of those they received as 'presents'. I would like to thank everyone who contributed or turned up on the day. Not all of the problems are represented in the January edition of the site but I am sure many of the others will pop up over the coming months and years. As I wrote the title to this article I intended it to reflect my time at NRICH, my short spell of what you might nominally recall 'retirement' since, and my continuing mathematical journey. It occurred to me however that another interpretation might be the process of problem solving itself. After all, every problem is a challenge to which we apply past knowledge and experiences, and a trick or two that we think might be useful on the way (see Trick or Treat?). As we proceed, we look forward towards our potential solution to see if we are heading in the right direction. When we problem solve we 'look backward' at past experiences that might be useful and 'forward' to the way ahead. Having written much about problem solving over the years, my aim in this short article is to offer a glimpse of me as a problem solver. The morning session was a special one. Everyone who was there had come to do mathematics together by way of celebration. There was a great atmosphere, lots of chatter, sharing and reflection on the mathematics. The problems challenged us, engaged us, required us to apply knowledge and think, at least a little, outside the box. It was just what I would love every mathematics classroom to feel like: a group of people doing, and enjoying doing, mathematics together. Occasions like this are rare for many of us, in fact none of us might have been in this situation since we were at school, and some of us may never have been that lucky. Reflecting on my time as a head of mathematics, when, as a department, we worked on and talked about mathematics together, it occurs to me now what a major factor this 'communal activity' was to our success. One of the important things about NRICH professional development is that it almost always involves teachers doing mathematics together. 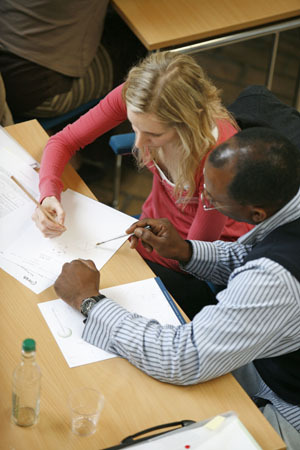 It is by experiencing the tension and 'thrill of the chase' that the team hopes teachers will begin to get a real sense of what problem solving in the classroom can be like (as well as offering time to become very familiar with a task so that you can take it back into the classroom with some sense of what might happen). Do you ever sit down and do mathematics for the pleasure of it? I do and in different ways at different times. Well there is of course my addiction to various forms of Sudoku and similar puzzles which, despite my best efforts, I find difficult to resist. 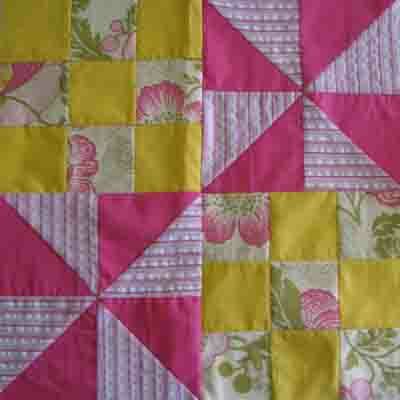 Then there is my new-found interest in quilting. I am not sure I want to confess to recently miscalculating the lengths of sides of some triangular pieces of material I needed to put together to match a 3x3 square ... All rather embarrassing - I forgot to add in one of the seams! My error became evident when the two squares did not match - but I cut some new pieces and, looking forward, I am fairly confident that I will not make the same mistake again! I suppose 'quilting maths' is little different from the everyday maths of living that I do without thinking; accounts, estimating time, cooking, tiling (I still have to finish grouting the shower room even though I have been retired five months), travel ... In general though, these applications of mathematics do not stretch my thinking and challenge me in the same way. I also engage in mathematics when someone mentions something that catches my interest (not unlike the attraction I feel for particular NRICH problems). This might be because it is based upon an idea I have not thought about before or, for some very personal and indefinable reason, it simply sparks my interest. Off I go to jot and think and jot and think ... or I find a book, or even look on the internet. Sometimes the stimulus is a new topic I am about to teach. I need to refresh my understanding and think about how I might make sense of it to others. I open a text book and start to read and then tackle problems in the exercises. If I have met some of the ideas before I tend to skim and if I am confident I just go for the last few questions in the exercise. If I get stuck I might re-read the intro, go to some 'easier' questions or even find a book that explains it better. Recently I have been reminding myself about the mathematics of the simple pendulum - a reminder precipitated by some Stage 5 problems on the NRICH website. I used a text book off my shelf from my early teaching days with 'old' units. I was not just reminding myself about the maths but testing my understanding and seeing how the author of the book went about trying to explain the topic. I can admit that starting with the last few questions of the chapter on this occasion proved ambitious - I resorted to re-reading, going to a modern edition which used international units (not because the principles were any clearer but just that the, now unfamiliar, units were a bit of a distraction) and gaining confidence with some questions that I felt I could do. What a worthwhile skill, being able to use books and resources to help oneself, which it would be great if we could encourage in all our learners. Last year I started to work through an old pure text book. On this occasion the motivation was an awareness that when I taught A-level maths there were places where I massaged the maths in order to avoid confronting gaps in knowledge, or lack of rigour in the mathematical arguments supporting particular results (for example, binomial theorem for negative powers and product of gradients of two perpendicular lines). Very recently, my daughter asked me if I could explain a step in some maths in a paper she was reading. This was more like research - a combination of recognising the mathematics, reminding myself of the detail and then trying to apply it to what was in the paper. The first two I managed, but I still cannot fit what I know to what the paper says. I think I might not have fully understood which were variables in the paper and which constants. I am bugged by this failure and will probably return to it on and off into the foreseeable future. All the above I have tackled alone, with varying degrees of success and frustration, and that real discomfort when you simply cannot get your head around an argument presented in a paper or book. The wonderful thing about that morning together in Cambridge was the search for patterns, the sharing of ideas, the enjoyment of being stuck but knowing that you were not alone. There were ideas that popped up that you could grab with both hands and use to help you move on, not least listening to how others saw things differently. I love mathematics and learning mathematics. This is not my only passion, but I cannot imagine a time when I will not want to do some mathematics for pleasure. Wouldn't it be great if we were all a little more passionate about the subject we taught and that our passion was evident and contagious? ... to start every department meeting or maths-focused staff meeting by doing some mathematics together. You might even consider a fortnightly challenge? You could use a problem from the NRICH website and on each occasion a colleague might take on the job of selecting the neatest/most engaging solution submitted by the rest of the team. You might even find there are other members of staff, not in the maths department, who would like to participate. May I wish you all wonderful and fulfilling mathematical journeys.